EPS went back and conducted follow-up interviews with both the Police Chief and Fire Chief, the two departments with the most impact in Dan Carson’s calculations. Based on those interviews and other factors, EPS strongly objected to the “cash accounting” approach and stood behind their original deficit projection. In the FBC deliberation that followed, which included EPS, Dave Freudenberger of Goodwin Consultants, and Andy Plescia, resulted in EPS and the Nishi developers accepting the addition of three annual “taxes/fees” specifically, $181,000 to cover Parks and Open Space responsibilities, $356,000 as a Community Services District, and $93,000 as a “make whole provision” to offset any future lost property taxes due to non-profit occupancy of portions of the Nishi commercial facilities. EPS/Goodwin/Plescia argued that The Cannery had set a precedent by agreeing to a 1.6% “Total Effective Tax Rate” (ETR) through the addition of an aggregate of 0.6% of special taxes over and above the base 1.0% per dollar of assessed valuation. EPS/Goodwin/Plescia and the developer were “comfortable” with taxing Nishi 2016 at that same 1.6% ETR level, and they believed the proposed $630,000 aggregate amount of the three additional annual “taxes/fees” achieved that 1.6% ETR level. As a result, EPS’ $106,000 deficit became a $524,000 surplus. The FBC rightly noted that $524,000 annual surplus meant no money would come out of the pockets of Davis taxpayers. That the Nishi project is a net fiscal positive for the City of Davis. The Commissioners did not agree on the amount of benefit the City would receive. The final motion to conclude $1,400,000 of annual benefit passed on a 5-1-1 vote; dissenters agreed that the benefits would be positive, but suggested numbers in the $500,000 range. That Staff Report was balanced and transparent because it provided Council with the tools to address both immediate cash impact on the City Budget, as well as the end-of-useful-life capital costs (maintenance and/or replacement) that come due when the pre-spending has been exhausted. It also identified the $900,000 per year the City needed to “save” in order to have the necessary money set aside to do the capital infrastructure repairs/replacement when they came due at the end of useful life. The graphic also shows that the “Cash Accounting” annual surplus in Nishi 2016 has plunged 90% from $1.4 million down to only $143,843. FBC’s report to Council stated, “Annual ongoing revenues and costs for the city from the project would be modestly net positive over time,” but unlike 2016 made no mention of the fiscal impact of the impact of “full life-cycle accounting” as EPS had done in 2016. I believe that FBC Report to Council is neither balanced nor transparent because it does not provide either the Council or the citizens with the tools to address both immediate cash impact on the City Budget, as well as the end-of-useful-life capital costs (maintenance and/or replacement) that come due when the pre-spending has been exhausted. It does not identify the $900,000 per year the City needed to “save” in order to have the necessary money set aside to do the capital infrastructure repairs/replacement when they came due at the end of useful life. 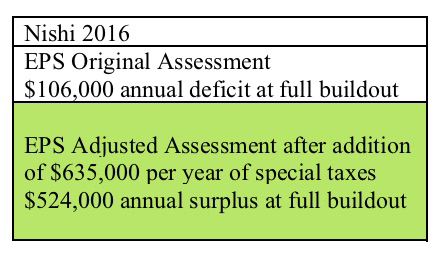 When you add that $900,000 per year capital infrastructure savings amount to the $143,863 surplus, the bottom-line of a “full life-cycle accounting” is a $750,000 annual deficit which will have to come out of the pockets of Davis taxpayers. This project will generate a one-time benefit of over $11 million in revenue for the City of Davis. Money that can be used for parks, roads and other city needs. Davis Unified School District will see an additional $2 million in one-time funding. The City also estimates almost $2.5 million in additional property taxes every year. That is an overstatement of the net one-time benefit by $11 million and overstatement of the City’s additional property taxes each year by more than $2.25 million each and every year. Add those two numbers together and you get a $36 million total overstatement over the life of the City’s New Development model for Nishi. The one-time benefit of over $11 million argument conveniently is silent about the one-time expenses that offset the one-time revenues. The true “net” one-time revenue impact of Nishi 2018 is zero dollars because under California Law the amount of Development Impact Fees that a jurisdiction can collect cannot exceed the reasonably estimated amount of incremental development impact costs incurred by the jurisdiction due to the new development. The Ballot Argument authors have made no effort to acknowledge, explain or correct the misleading overstatements, despite having been made aware of them. Perhaps they don’t care whether they are misleading the public. (A) The City can follow the example of its 2016 economic consultant EPS and disclose/address the “full life-cycle accounting” fiscal impact of Nishi 2018. Such a disclosure would be consistent with the long-range planning principles behind the Council-commissioned Leland Model, as well as the 20-year Forecast included as Chapter 4 of the City Budget. (B) The authors of the Ballot Statement can explain why the Ballot Argument overstates the benefit to Davis taxpayers by more than $36 million over the life of the City’s New Development model for Nishi. Option Two – until such time as the steps in Option One are completed … given the lack of balance and transparency of the Nishi 2018 fiscal analysis when compared to the Nishi 2016 fiscal analysis, coupled with the clear problems with the ballot statement, anyone who believes in honesty can cast an honest “No” vote on Measure J.
I studied this article in great detail and . . .
One thing that I think would be helpful would be to look at the Cannery fiscal model and see how actual costs have occurred. The problem still comes down to what is an actual cost. For me the cost of a development is a cost that the city pays due to the development, that it wouldn’t otherwise have incurred. That gets a little tricky here. For example, how do you factor incremental costs. Clearly neither Nishi nor Cannery are not going to cause the city to add firefighters or police officers. On the other hand, at some point, we probably will and therefore there is probably an incremental costs, but not at the levels either model is projecting. That’s just the easiest example to come up with. Are you recommending a NO vote on Nishi? Comment… there are a lot of “what if’s” built into the model… ‘your results may vary’… one way, or the other… best case scenario, worst case scenario… what does that translate to per person or per household/year? Howard P asked . . . Question to the author… Are you recommending a NO vote on Nishi? 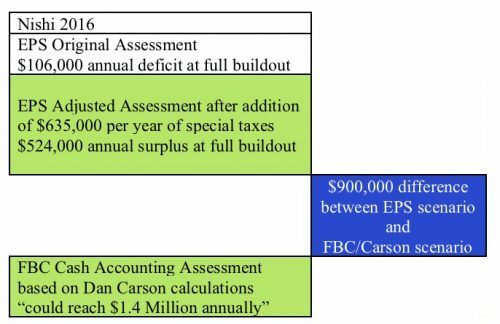 1) The City can follow the example of its 2016 economic consultant EPS and disclose/address the “full life-cycle accounting” fiscal impact of Nishi 2018. Such a disclosure would be consistent with the long-range planning principles behind the Council-commissioned Leland Model, as well as the 20-year Forecast included as Chapter 4 of the City Budget. (2) The authors of the Ballot Statement can explain why the Ballot Argument overstates the benefit to Davis taxpayers by more than $36 million over the life of the City’s New Development model for Nishi. Those are my immediate recommendations. If I were the City I would also explain (A) why the FBC and the City chose to discard the Full Life Cycle Costing approach in the Nishi 2018 analysis, and (B) why the City paid the economic consulting firm EPS upwards of $100,000 to evaluate Nishi using a Full Life Cycle Costing approach in 2016? It is important to note that the City has known about the $11 million and $25 million misrepresentations in the Ballot Argument for well over a month, but all the voters/citizens have gotten to date is silence. No acknowledgement of the misrepresentations. No explanation of the misrepresentations. Perhaps they are hoping that those inconvenient untruths will simply go away if they ignore them long enough. If, in the next two weeks, the City and the Nishi developers choose to ignore the clear problems identified … given the lack of balance and transparency of the Nishi 2018 fiscal analysis when compared to the Nishi 2016 fiscal analysis, coupled with the clear problems with the ballot statement, anyone who believes in honesty can cast an honest “No” vote on Measure J.
Matt appears to be correct on the $2.25 million. It appears that was an error and it seems more like there was an overall tax benefit of $2.something million over the 15 years, rather than an ongoing $2.25 million. The $11 million issue is more subjective. Overall, I get what Matt is trying to do with finances, but I don’t believe that Nishi is costing the city money in real dollars (as opposed to theoretical dollars). I believe Nishi should be evaluated on the intrinsic “costs” or “benefits”… on cost side traffic/people… on the benefits side housing and primary access to UCD vs W Olive. I understand your point Howard. However, there is absolutely no cost to the City associated with being honest and transparent. The City, and specifically staff, saw value in reporting to Council both the Cash Accounting margin ($1.4 million per year) and the Full Life Cycle Costing margin ($500,000 per year) for Nishi 2016. That was a job well done, and they used high quality resources from EPS to do so. In Nishi 2018 the $1.4 million a year Cash Accounting margin has shrunk by 90% from $1.4 million down to $143,000. That is clear evidence that supports the “this 2018 Nishi project is inferior to the 2016 Nishi project” comments made by the Council members from the dais in February. With that said, it doesn’t answer the question EPS asked (and addressed) in 2016 … how much are the total costs of the project when repair replacement of the Nishi capital infrastructure happens at the end of its useful life? At the risk of repeating myself, there is absolutely no cost to the City associated with being honest and transparent about those costs. That’s not exactly true. You are mistaking the fiscal bottom line for quality of project. The 2016 project had a commercial component while this one focuses on student housing. While we can argue that we need economic development, the flaws in 2016 were such that none was generated. We also quite desperately need student housing – something that this project does well to provide, but student housing isn’t going to be a revenue generator for the city. So it’s a trade off. The other possibility appears to be that the tax benefit is $2.75 million, just a lot of that is not going to the city, but rather an overall benefit. David, instead of individual citizens speculating, why aren’t the City and the developer coming forward to explain the facts behind their assertions? After all they are “informing” the voters with those statements. Does the City consciously want misinformed voters? I think that you are hitting on points that are broader than a single project and probably would be better discussed absent an election. I think you would get more traction if you did so. Alan: “I studied this article in great detail and . . .
You all know I am terrible with numbers so I won’t pretend to address that specific issue. However, I do see a parallel. This is not the only issue on which we are asked to weigh actual, known factors with theoretical concerns. We know for a fact that without Nishi ( and Lincoln 40 and the UCD contribution to housing) many more students will have to commute from more distant neighborhoods and communities. The transportation study has demonstrated that many of these trips will be by automobile. We know that increased automobile trips lead to more air pollution. This we are asked to not consider at all by those who would have us vote against Nishi because of theoretical ( or at least not proven) air quality risks unique to the Nishi site. I have a preference for prioritizing the known over the theoretical, whether it involves city financing or air quality concerns. Can you post even one of Dan’s “overly-optimistic projections” and tell us why you feel it is “overly-optimistic”? Ken: Not sure why you’re asking this, since examples of Dan Carson’s “optimism” were already provided in the article above. How are either of those examples of “optimism” rather than examples of different views on how to allocate costs? You’re arguing over semantics. Substitute the word “different” (compared to EPS and other FBC commissioners), if you’d prefer. The end result is that Dan Carson’s method does not fully allocate costs, regarding a given proposal. Note that such concerns might also apply regarding the senior citizen development proposal (WDAAC). If Dan gets on the council, look for that approach to continue (and intensify). Especially if Nishi is approved, without an innovation center component. I’m asking a question. As I’ve stated previously Dan Carson’s method better accounts for balance sheet differences whereas allocating costs, isn’t calculating the costs of the development because the costs exist regardless of the development. I view those are separate questions. One question is how much will the development cost the city. The other question is how much should the development pay towards its fair share. Those are separate questions – each important. But the fiscal impact of the project is being overstated if you are looking at the second. As I’ve stated previously Dan Carson’s method better accounts for balance sheet differences whereas allocating costs, isn’t calculating the costs of the development because the costs exist regardless of the development. As a side note, there are costs associated with increased services, even if a particular development does not push the city “over-the-edge” regarding hiring additional employees. If one were to employ the approach that you suggest, then 1) either the current employees have “extra time on their hands” (and are able to handle additional workload), or 2) some future development would be improperly allocated all of the costs for the additional employees (e.g., police/fire) that would ultimately be needed. As a side note, there are costs associated with increased services, even if a particular development does not push the city “over-the-edge” regarding hiring additional employees. If one were to employ the approach that you suggest, then 1) either the current employees have “extra time on their hands” (and are able to handle additional workload), or 2) some future development would be improperly allocated all of the costs for the additional employees (e.g., police/fire) that would ultimately be needed, as the city continues to grow. David, you are making the same mistake that Dan is. You are hanging your hat on the possibility that there is a “right” number. The truth is that every number is going to be “wrong.” Therefore, the wise decision-making approach (using solid Critical Thinking principles) is to calculate multiple scenarios to “bracket” the likely outcome. The only thing we know about models is the answer is wrong. My problem is that we are not dealing with real costs and therefore we are overstating the fiscal impact of a given project – a small one at that. You may be right David, but it is thinking like Dan’s and yours that has gotten us into the $8 million annual Budget shortfall in the first place. I don’t agree. What got us into the $8 million shortfall in the first place was failure to fund (or underfund) infrastructure repair over a prolonged period of time. Matt was right in a previous post… the best we can do is “bracket” the range of probable costs/benefits (financially)… there is something called ‘Monte Carlo Analysis’ where you can come up with the 50-50 guess of the most likely outcome. And the range of probabilities on either end of that. But the model cannot ‘fiscalize’ the pros/cons of housing availability/affordability, congestion, etc., etc. Far too many assumptions, far too many variables… perhaps that’s why we need ‘common sense’. Note the references to Dan Carson, in the article above. If Dan Carson gets elected, I strongly suspect that we’ll see more overly-optimistic projections regarding future proposals (e.g., MRIC). Especially if Nishi is approved without an innovation center component. Capital replacement should not be prepaid before replacement. Current and ongoing residents pay the initial upfront costs for buildings and infrastructure. Then when it is replaced, the then-new residents will pay those costs in the future as though the capital is new. To prepay through a sinking fund or some other mechanism causes current residents to pay twice and lets future residents off the hook. RMcC, I think you probably have a good point, but I don’t know these terms, so I imagine others don’t either (I don’t know much about financin’ stuff). Could you explain what is being done and what should be done, with some laymany language . . . ? Does anyone know who is scheduled to pay for the “initial upfront” costs for the new roads, sidewalks and utilities at Nishi? I know that “it depends” where some cities will pay for everything and build roads and run utilities in the hope of getting some development where other cities will not only make the land owner pay for every penny of site work bet get them to build a new firehouse or school off site. 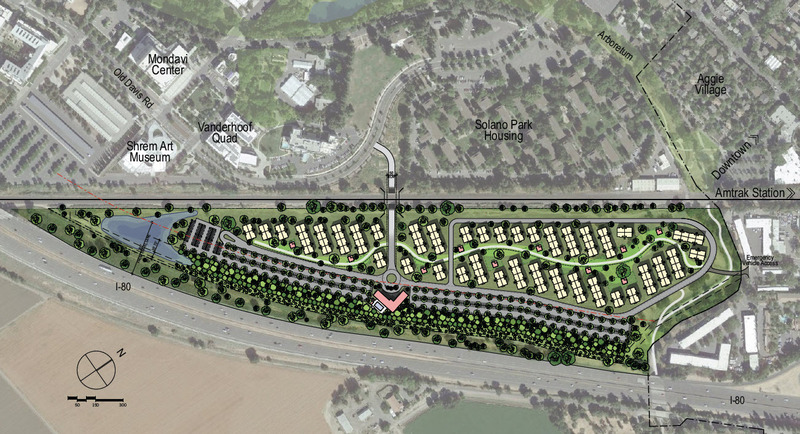 Ken, as is the case in most developments in Davis (other than the ones with a Mello-Roos CFD) the developer pays the “initial upfront costs” for the new roads, sidewalks and utilities. The developer then gets reimbursed for those costs either (A) in the sale price of the residences, or (B) in the monthly rent payments of rental properties. The City gets stuck with the costs of wear and tear. Think of it like the roof on your house. The developer gets paid for the initial construction costs, but the homeowner gets stuck with the roof replacement costs when it reaches the end of its useful life. The same is true for driveways. The same is true for Washer/Dryer/Fridge/Dishwasher/Oven appliances. The same is true for painting the interior/exterior of the house. The same is true for new carpet/flooring. The same is true for the big tree that’s rotten and leaning towards your house. The last number I saw was that the new Nishi site was going to have 650 big apartment units (so big some call them “mini-dorms”). A newer 3-4 bedroom apartment in Davis is worth ~$125K/bedroom so ~$375K-$500K/unit. 650 units worth an average of value $425K will kick off almost $3 MILLION a year in in property tax revenue to the city and state (over $3mm a year by the 3rd year with the 2% prop 13 increases). This city’s share of this should be plenty of money to cover the cost of any road maintenance. The 650 units will also pay millions to the utility providers that will be enough to pay for new cable TV wires, PG&E Lines, water pipes, sewer lines and garbage cans and trucks. How we “save” for those capital infrastructure repair/replacement costs is subject to discussion … but we ignore them at our own peril. Just look at the current condition of our streets. I disagree that that is the lesson. The reason we have an $8 million shortfall is primarily for two reasons. First, that we relied on federal and state funding for roads and when that money ceased, we were too slow to replace those funding sources. Second, we have relied on parks funding that was too little when the parks tax was passed. There are some legitimate points raised here about how we should fund replacement, but using that as a campaign issue in my opinion is wrong, particularly given the shortage of student housing in town. You end up punishing the wrong people by go after it this way. Don’t forget we also have an average TCOE of over $100K for people working for the city with many over $200K. Like many cities with the cost per employee going up faster than income Davis has to make some hard choices. In most cases it is not the employees getting rich but the cost of healthcare and pension contributions that are having big increases. Early in 2017, Mayor Robb Davis presented his State of the City view where he laid out the dire fiscal situation for the City as determined by the efforts of a Jeff Miller chaired FBC. Immediately after Robb’s presentation, the City Manager had his ACM stand up and state that ‘everything was under control,’ implying that the Mayor was wrong. It was roughly five months later that Bob Leland’s consultant report largely confirmed the Mayor’s (and the FBC’s) position. We have a > $8 Million annual shortfall because the CC majority and the previous City Manager have fiscally mismanaged the City, and they (and previous CC majorities/CMs) have been completely ‘disingenuous’ about the state of the City’s budget for years, if not decades. The most important thing to understand is that this shortfall is not new, which is why we have $100’s of millions in accumulated unfunded obligations that we now need to address. Our shortfall is due to one thing and one thing alone, we have grossly overcompensated our employees (in terms of Total Comp, not just salary). It really is that simple. The solution, unfortunately, is much more complex and difficult. I’m not sure what you’re utter bs-ing, but I don’t disagree with that. One reason they didn’t fund infrastructure was that they chose to not do deep cuts to employee compensation. To have future users (if any, to one school of thought) cover the entire replacement for existing, is just greed. Well said Howard. Very well said. I direct you back to Richard’s comment on that one on the replacement costs. On your side note, I don’t agree. For example, the allocated costs of police is not an incremental costs, it amounts to several additional police officers. That’s not accounting for the legitimate point you raise about pushing the city “over-the-edge” – it overstates the impact of the development. And the majority of the commission, city staff, and myself do not agree with Ray on this. I recall that city staff was actually considering the type of issues raised by Ray, Matt, and EPS. Not sure of the status of that. If one were to rely solely upon the majority of a commission (and in the absence of an external analyst for this version of the proposal), then one might want to also consider the unanimous recommendation by the Natural Resources Commission to conduct an air quality study on the site. Your statement makes no sense. Costs are created by new developments. Seems like you’d rather allocate those costs to existing developments / the city at large. No, costs and the need for services exist already. Some of those costs may expand, but the models I see employed are overestimating those costs by a large margin. He might have a life. He might, indeed. But, David referred me to Richard’s comments, to which Matt had already responded. EPS utilized standard industry methods to compute the expenditures for both the Annual Fire and Police expenditures. In response to concerns over the level of public service cost associated with the project, EPS conducted interviews the Chief of Police, Darren Pytel and Assistant Fire Chief, Rick Martinez. Chief Pytel indicated that the estimates made by EPS were reasonable and appropriate particularly given concerns of difficulties in enforcement within the area due to constrained access. Similarly, Assistant Chief Martinez advised against running any scenarios with reduced Fire Department costs due to a need for increased labor resulting from the population and employment growth attributed to the project. Based on these interviews, EPS did not construct any additional sensitivity scenarios to reflect lower public service costs. It is within your rights to ignore EPS’ professional opinion, but if you do you will be walking down the same road that past Councils walked when they ignored staff’s professional advice about the requirements of capital infrastructure maintenance and deferred that maintenance. The result of that short-sighted, politically-driven thinking is the current dilapidated state of our roads and the $8 million per year Budget shortfall reported by Bob Leland and confirmed by City Council as part of Chapter 4 of the City’s Budget. Howard can confirm that in the past staff told Council (on numerous occasions) not to defer capital maintenance, but they went ahead and did it anyway. You and Dan are now telling the voters to ignore capital maintenance at Nishi. It was unwise then and it is just as unwise now. Some might, but might also not be the responsibility of the city (e.g., beyond city limits). I would guess that most infrastructure, maintenance, and service costs increase exponentially, as land is converted from farmland to urban uses. So I question where the developer is leaving leaving us short on costs. And there are no parks, greenbelts, or street trees. If that’s the case, what does that $900,000 cover? Excellent question David. In their 2016 Nishi analysis EPS very clearly and explicitly included those full life-cycle costs in each expense category and in their analysis totals. When Dan Carson put forward his parallel scenario (supported by many of the FBC members, including myself) where the annual savings for end-of life capital infrastructure repair/replacement costs was eliminated, EPS went back and interviewed the Department Heads most-affected by the calculations Dan presented to the FBC, most notably Police Chief Pytel and Assistant Fire Chief, Rick Martinez. Chief Pytel and Chief Martinez were very clear with EPS. As reported in the February EPS report to the FBC and Council, the two Chiefs did not agree with the cuts. Chief Pytel indicated that the estimates made by EPS were reasonable and appropriate particularly given concerns of difficulties in enforcement within the area due to constrained access. Similarly, Assistant Chief Martinez advised against running any scenarios with reduced Fire Department costs due to a need for increased labor resulting from the population and employment growth attributed to the project. Nishi 2016 had private ownership of parks and open space AND at the same time included a $181,000 annual payment to the City for parks and open space maintenance. Why? Because staff strongly objected to the idea of private maintenance of the Nishi parks and open space because of uncertain reliability of private maintenance in similar situations in the past. In Nishi 2018 any such discussion have happened behind the Wizard of Oz’s curtain … and we haven’t had Toto available to pull back that curtain and provide the citizens/taxpayers with any kind of transparency. Regarding roads, I will turn your question right back to you. What is the equivalent annual “savings” that should be accumulated to prepare for the road repair/replacement costs when they arrive? The graph below (from Chuck Mahron’s Strong Towns website) illuminates how savings should happen, as well as how insufficient savings puts cities like Davis in the deteriorating roads situation we currently face. The whole 2016 FBC Nishi analysis process, led by EPS openly, transparently and thoroughly looked at (and publicly disclosed) those issues. Nishi 2018 has not done so. If that’s the case, what are you expecting them to cover with additional $900,000 in payments. David, I’m sorry this is so challenging for you. As you know, EPS created a series of analysis reports for the City and presented their findings to staff, the FBC and Council. They broke down the expenses into the same 10 categories/departments that the City uses in its Budget. Each of the categories includes (A) the ordinary operational expenses for running the department(s) contained in the category, and (B) an annual amortization of the capital repair/replacement expenses for the respective department(s). 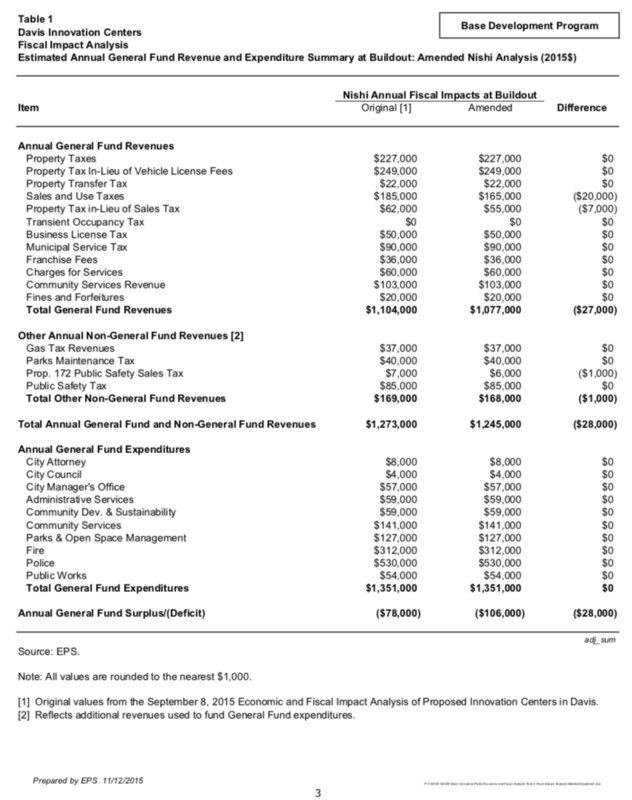 You can view those categories in the EPS analysis report in the January 2016 FBC packet http://documents.cityofdavis.org/Media/Default/Documents/PDF/Finance/Commission%20Agenda%20-%20January%202016/January%202016/Item%20No%206c2_Fiscal%20Add%20m1%2011-12-15.pdf However, to make it easy for everyone, Table 1 of that report is included in the graphic below. Note that the $127,000 figure already had been adjusted downward by EPS to account for the private ownership and maintenance of the on-site parks and open-space land. On the advice of staff, to reduce the chances of any non-maintenance of the parks and open space happening, the FBC recommended that the City be responsible for the maintenance and that the developer pay the City each year the amount of money needed to maintain the parks … $181,000 was the amount subsequently mutually agreed to by staff, the developer, EPS and the FBC. With that said, please note when you look at the EPS table there is a $54,000 amount for Public Works, which includes the annual amortization for roadways and pedestrian/bicycle infrastructure end-of-life repairs/replacement. So, if the City were actually transparently and openly reporting the fiscal impact of the Nishi 2018 project, the first $54,000 of the $900,000 can be removed because the City’s costs for roads have been removed. Similarly, $181,000 for maintenance of parks and open space on the Nishi site (also documented on Page 10 of Dan’s memo, as well as subsequent EPS and FBC documents). That leaves $665,000 to cover the end-of-life capital infrastructure costs EPS included for the categories/departments City Attorney, City Council, City Manager’s Office, Administrative Services, Community Development and Sustainability, Community Services, the portion of Parks and Open Space not actually on the Nishi site, Fire, and Police. The sad reality of the dialogue you and I are having here is that it is 100% unofficial, off the record, and unavailable to the overwhelming majority of Davis citizens, residents, business owners and voters. The City has chosen, for reasons that only they can explain, to hide this information from the citizens, residents, business owners and voters. YOU AND I SHOULDN’T BE RESPONSIBLE FOR ILLUMINATING THE FISCAL REALITIES OF THE NISHI PROJECT. THE CITY SHOULD BE DISCHARGING THAT RESPONSIBILITY. The 2016 consideration of the fiscal impact of Nishi was open, transparent, thorough and balanced. Staff made sure to convey BOTH the majority decision of the FBC (by a 5-1-1 vote) and the voice of the dissenters (which included EPS). The 5-2 vote of the FBC in 2018 closer than the January 2016 FBC vote tally, and if I had not been out of the country that night the vote would have been an even closer 4-3. For reasons that only they can explain, staff and Dan Carson chose to suppress any mention of the dissenting opinions in reporting to both the Planning Commission and City Council. They also chose not to illuminate the 90% plunge in the “Cash Accounting” annual surplus from $1.4 million in 2016 to $143,000 in 2018. Bottom-line, the Nishi numbers don’t add up … honesty and transparency is missing. I’m glad I read this today rather than last night. I appreciate your explanation. I still disagree, but now I at least understand where the numbers are coming from. And let me couch that disagreement. Because this gets back to my original point – I agree with you that we have to figure out as a whole how to deal with what you are calling lifecycle infrastructure issues. Where I disagree with you is that I don’t think this should be bootstrapped onto the fiscal impact of a given development. Most of this stuff is still stuff we have to pay for regardless and we are arguing over what the fair share is for a given project. Just wanted to thank Matt for putting this information together, and for presenting it. And for doing so in an objective, non-political manner. Never let it be said that Matt, Ray, and EPS didn’t warn us. Your comment does not conflict with mine, so I’m not sure why you posted it. I’d call that a “warning”. Assuming they are right, you mean? Craig, the one “guarantee” is that no specific number will be “right.” All the specific numbers will/do have flaws based on their respective assumptions. Unfortunately that has not happened this time around. As a result we are in the position where we have to make an under-informed decision.